The principal route runs from Dakar on the Atlantic coast to Bamako and Koulikoro, a distance of 800 miles, which is some 80% of the total route miles. Short branches run from Dakar to St Louis, Unguere & Touba. The towns of Bamako and Koulikoro lay close by the Niger river, hence the railway's name 'The Dakar - Niger Railway'. Considerable realignment & reconstruction in 1951 flattened the steepest grades to 1 in 100, the highest point of the line was 1,515ft near Bamako. Diesel traction began in the late 1940's. Prior to World War 2 an order was placed for six diesel-electric Bo-Bo type locomotives from Alsthom in France. The war delayed delivery until 1947, after which an order for a further ten was placed, with these arriving in 1949-1951. The power unit was a six cylinder Sulzer 6LDA25, pressure charged on the exhaust-gas system with a Brown Boveri turbo blower. Cylinder size is 250mm by 320mm, developing a continuous output of 655hp at 795rpm, with a one hour output of 735hp at 850rpm. However because of extreme conditions on the Dakar - Niger line, 100% humidity for three/four months in the wet season and ambient temperatures reaching 112-120F (45-48C) in the summer, the engine output was reduced to 610hp at 795rpm. In typical Sulzer fashion the welded steel crankcase structure incorporates the bedplate, the extensions rigidly supporting the generator set. The power unit was constructed at the CCM-Sulzer works at St Denis. The locomotive was 39ft 5in long over buffers, 12ft 10in high, with a short wheelbase of 6ft 6.75in. Two cabs were fitted, the engine generator set occupying the center of the locomotive, electrical equipment was housed at one end, air compressors, exhausters and the cooling group were at the other end. Buffing and drawgear were carried on the bogie headstocks, the traction motors were nose-suspended driving 35.5in diameter wheels. Weight in working order was 47.5 tons giving a maximum axle loading of 12 tons. Continuous tractive effort at the wheel rims was 7,180lb, at the top speed of 43mph it was 3,600lb. Multiple unit control was fitted permitting trailing loads of up to 650 tons on the western section as far as Toukoto, on the more severely graded eastern section 250 tons was permitted. Automatic vacuum brakes were fitted. Passenger train weight rarely exceeded 275 tons. 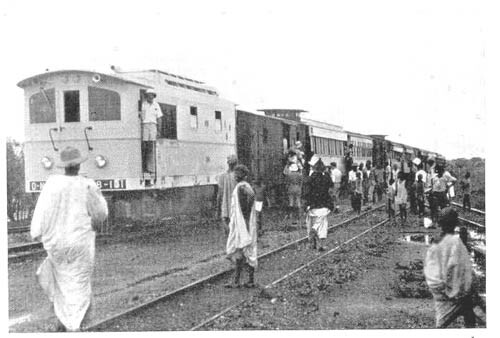 The main depot and repair shops were at Thies, about 25 miles east of Dakar. A round trip over the whole length of the line would cover 1,620 miles and would take eighty hours, commencing at Thies, west to Dakar, east to the end of the line at Bamako, returning to Dakar, then back to Thies for servicing. Following dieselisation the twice weekly through passenger train took only 28 hours instead of 36 hours (an average speed of 29mph). The two semi-direct trains were allowed 43 hours, operating practice on most trains has been to leave the controller in top notch once the initial acceleration has been completed, no change being made until the next station stop. With top speeds limited to 43.5mph and because of the track conditions & timetabling restraints the annual mileage rarely exceeded 51,000 miles in the early years. Teething troubles were encountered in the first fifteen months with the traction motors, including brush & fan replacements. These problems appeared to relate to the diagramming of the locomotives on heavier, slower trains than was intended. Experience gained on the locomotives, both by the operating staff and the maintenance staff eliminated the majority of the teething troubles. The manufacturer took note of these issues and developed an improved form of traction motor better suited for tropical conditions. This included field shunting above a track speed of 25mph, the earlier motors didn't have this feature. The sixteenth locomotive delivered was fitted with these new motors, the bogie wheelbase was longer, now 7ft 10in. Also changed was the tractive effort - now 4,020lb at 10mph. These changes allowed almost twice the tonnage to be hauled whilst maintaining existing schedules. Seven of the existing locomotives were rebuilt with the new style bogie & motor. Some locomotives would also receive changes to their control system, to allow a maximuum speed of 53mph, giving better acceleration for the lighter passenger trains. 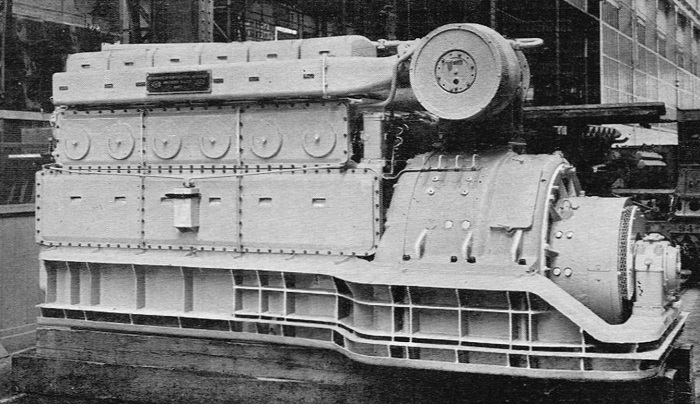 The only recurrent failures connected with the Sulzer engine concerned the Brown Boveri turbo-blower sets on the first six engines. An improved version of the turbo-blower was fitted and the troubles disappeared. Odd failures in the early days included stoppages due to lubricating oil leakage, fusing of connection between battery elements, and water pressure failure due to the poor state of the track. Improving staff experience on their new machines and of their maintenance/examination schedules led to an improvement in reliability. One of the 1947 series locomotives in service. The three views above, graciously provided by John Middleton shows veteran BB102 at Korofina on June 27th 2005. This locomotive was still present in November 2010. During 1954 eight locomotives were delivered from the Ateliers de Forges de la Loire workshops at St. Chamond, France. 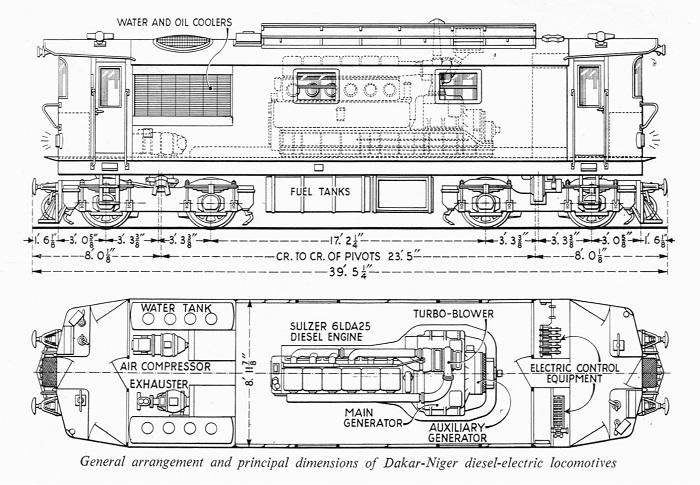 These locomotives joined sixteen earlier Sulzer powered Alsthom built Bo-Bo diesel electrics on the metre gauge Dakar - Niger Railway. There were however major differences with these new machines. 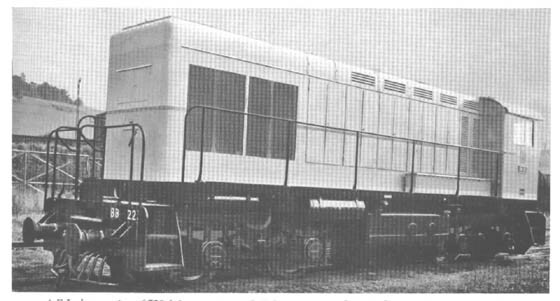 The earlier machines carried a cab at each end, the new locomotives had a single cab. The transmission was now hydraulic and there were many differences in the locomotive's dimensions. They were 40'2" long and 9'2" wide, top speed was 44 mph with a service weight of 50 tons. Power was obtained from a 6LDA25 engine, improvements to the pressure charger and other engine components now put the engine output at 720bhp at 850rpm. As these engines were now coupled to a hydraulic transmission the auxiliary drives were by belts from the rear end of the converter casing. These belts operated the auxiliary electric generator, the engine water circulating pump, fuel transfer pump, air compressor, vacuum brake exhauster and radiator fans. A large air filter was located above the hydraulic torque converters, air was drawn from the roof by the exhaust gas turbo blower. Starting tractive effort at the wheel rims was 40,800lb, continuous tractive effort was 27,600lb at 6.2mph. The transmission was a Voith L.36rd with three converters. The primary shaft and the step up gears were driven from the engine through a Secheron blade type of flexible coupling. The converter casing is carried on the locomotive underframe separate from the engine. Below it was the gearbox carrying the reversing gears and a reduction gear. From here cardan shafts ran forward and backward to bevel drives on the inner axle of each bogie, additional shafts carried torque to the outer axles. Torque reaction from the axle drive was handled by a link with a pin and eye connection to the bogie center. The fuel tank held 905 gallons of fuel. Line drawings of this diesel hydraulic machine. 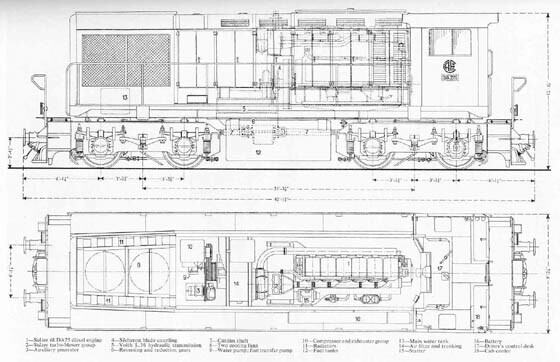 The above information/photograph/drawing is courtesy of an article in 'Diesel Railway Traction' from July 1955. Page updated July 5th 2005.